In this paper, we concentrate on linear programming problems in which the cost vector, the technological coefficients and the right-hand side values are interval-valued generalized trapezoidal fuzzy numbers. To the best of our knowledge, till now there is no method described in the literature to find the optimal solution of the linear programming problems with interval-valued generalized trapezoidal fuzzy numbers. We apply the signed distance for defuzzification of this problem. The crisp problem obtained after the defuzzification is solved by the linear programming methods. Finally, we give an illustrative example and its numerical solutions. 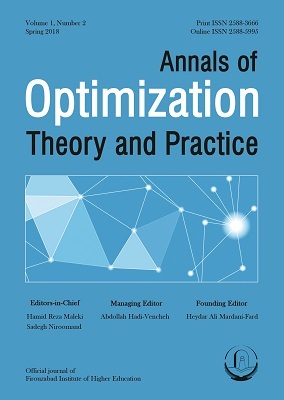 Allahviranloo, T., Lotfi, F. H., Kiasary, M. K., Kiani, N. A., & Alizadeh, L. (2008). Solving fully fuzzy linear programming problem by the ranking function. Applied mathematical sciences, 2(1), 19-32. Baranifar, S. (2018). A credibility-constrained programming for closed-loop supply chain network design problem under uncertainty. Annals of Optimization Theory and Practice, 1(1), 69-83. Bazaraa, M. S., Jarvis, J. J., & Sherali, H. D. (1990). Linear programming and network flows. John Wiley, New York, Second Edition. Chen, J. H. C. S. M., & Chen, S. M. (2006). A new method for ranking generalized fuzzy numbers for handling fuzzy risk analysis problems. In Proceedings of the Ninth Conference on Information Sciences, 1196–1199. Chen, S.H. (1985). Operations on fuzzy numbers with function principal. Tamkang Journal of Management Science, 6 (1), 13–25. Chen, T. Y. (2012). Multiple criteria group decision-making with generalized interval-valued fuzzy numbers based on signed distances and incomplete weights. Applied Mathematical Modelling, 36, 3029–3052. Chen,S.H. (1985). Ranking fuzzy numbers with maximizing set and minimizing set. Fuzzy Sets and Systems, 17, 13–129. Ebrahimnejad, A. (2016). Fuzzy linear programming approach for solving transportation problems with interval-valued trapezoidal fuzzy numbers. Sadhana, 41 (3), 299–316. Farhadinia, B. (2014). Sensitivity analysis in interval-valued trapezoidal fuzzy number linear programming problems. Applied Mathematical Modelling, 38, 50–62. Gorzalczany, M. B. (1987). A method of inference in approximate reasoning based on interval-valued fuzzy sets. Fuzzy Sets and Systems, 21(1), 1–17. Hong, D. H., Lee, S. (2002). Some algebraic properties and a distance measure for interval-valued fuzzy numbers. Information Sciences, 148 (1), 1–10. Turksen, I. B. (1996). Interval-valued strict preference with Zadeh triples. Fuzzy Sets and Systems, 78 (2), 183–195. Wang, G., Li, Xi. (1998). The applications of interval-valued fuzzy numbers and interval-distribution numbers. Fuzzy Sets and Systems, 98, 331–335. Wang, G., & Li, X. (2001). Correlation and information energy of interval-valued fuzzy numbers. Fuzzy sets and systems, 103, 69-175. Zadeh, A. (1965). Fuzzy Sets. Information and Control, 8, 338-353.